Editor's note: A previous version of the story incorrectly stated the date of the community meeting in Hoopa. The meeting took place Tuesday night. The Mill Creek Fire, burning in the Hoopa Valley south of Weitchpec, continued to grow overnight and now stands at more than 2,000 acres. Orleans, Weitchpec, Hoopa, Willow Creek and Bald Hill are all being rated as having unhealthy air quality due to the smoke and officials are cautioning anyone living in the area who has breathing issues or other sensitivities to stay inside or to visit a clean air site. Coastal areas are expected to be in the moderate zone, but sensitive individuals should consider limiting prolonged or heavy outdoor exertion. Garberville, being impacted by fires to the south, is also in the moderate range, according to the North Coast Unified Air Quality Management District. Residents are also being directed to individual school websites for information about possible schedule changes due to the closure of State Route 96 between Bull Creek and Mill Creek. A $10,000 award is currently being offered for information on the fire, which has been determined to be arson. Hoopa Neighborhood Facility, 11860 State Hwy 96, Hoopa; 8 a.m. to 5 p.m.
Hoopa Health Association Senior Nutrition Center will be available to tribal seniors; 768 Loop Road, Hoopa; 8 a.m to 5 p.m.
Weitchpec Tribal Office, 23001 Highway 96, Weitchpec; 9 a.m. to 5 p.m.
Morek Won Community Center, 390 McKinnon Hill Road, Weitchpec; Mon-Fri 9 a.m. to 3 p.m.
For more information on air quality, visit wildlandfiresmoke.net/outlooks/HoopaValley-EurekaArea or call toll-free at (866) BURN-DAY [(866) 287-6329] or visit the air quality district’s website at www.ncuaqmd.org. For the latest fire information, visit: fire updates on the Hoopa Fire Department and Office of Emergency Services Facebook Page at: https://www.facebook.com/HoopaOES/ or check fire updates for Mill Creek 1, and throughout the country on Inciweb at: https://inciweb.nwcg.gov/incident/6161/. FIRE UPDATE: The fire was active last night. The fire made a significant run across Mill Creek Road, approximately 150 acres. Fire continued to back to the west toward Highway 96. Established containment lines around the rest of the fire held. Today, resources will use direct attack to catch the fire where it crossed at Mill Creek Road overnight. A structure protection group will begin working in the community today assisted by the Hoopa Valley Volunteer Fire Department. Resources will continue to hold the fire along Highway 96 keeping the fire east of the highway and the Trinity River. Smoke is an issue for those living in and around Hoopa Valley. You can find a detailed description of the Air Quality Index at this site: wildlandfiresmoke.net/outlooks/HoopaValley-EurekaArea. A resource advisor (ARA), assigned to the Team, will be doing smoke forecasting for Hoopa Valley and Eureka. We want to encourage everyone who has issues with the level of smoke in the valley to stay inside or visit the clean air sites located in Hoopa. Smoke is driven by terrain-influenced winds that are unique to each location and valley. The current weather pattern is not expected to change in the next few days so the daily timing of peak impacts will not change but the magnitude may increase if the Mill Creek 1 and other wildfires continue to grow. 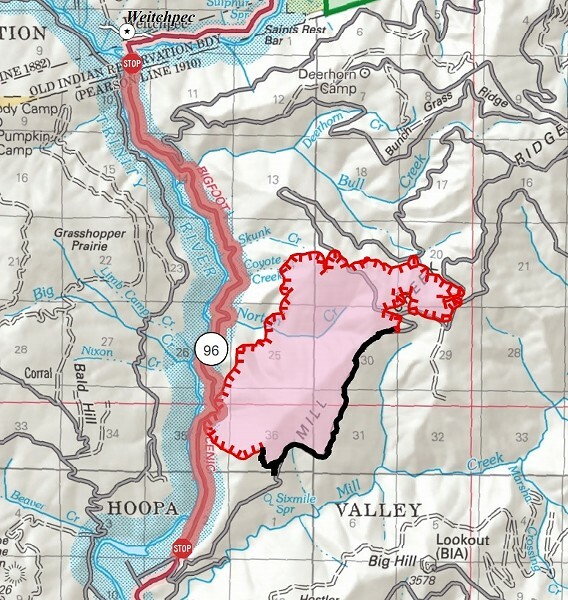 Attention: The Mill Creek 1 Fire was caused by arson on Tribal lands near Hoopa, California. There is a $10,000 reward offered for information regarding the fire. Calls will be taken on an anonymous hotline by calling 1-800-468-4402. FOR MORE INFORMATION: Get the latest fire updates on the Hoopa Fire Department and Office of Emergency Services Facebook Page at: https://www.facebook.com/HoopaOES/ or check fire updates for Mill Creek 1, and throughout the country on Inciweb at: https://inciweb.nwcg.gov/incident/6161/.